Will Kendall Square finally feel like a real neighborhood? 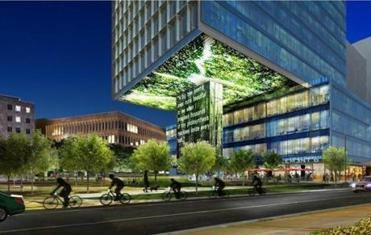 A rendering of the proposed Kendall Square project. Now a new wave of development should soon turn the bustling business district into a place for people, too. The Massachusetts Institute of Technology received approval Tuesday night from the Cambridge Planning Board for six new buildings along Main Street and Broadway. And around the new offices, housing, and graduate-student dorm will be plazas, public spaces, and storefronts that may make Kendall finally feel more like a neighborhood than an oversized office park. There’s even room for a grocery store. MIT’s plan is one of several big projects in the works in Kendall Square that reflect the next phase in its evolution from industrial afterthought to the heart of the region’s life science and tech economies. Collectively, they would add millions of square feet of office space and perhaps 2,000 units of housing to one of the hottest real estate markets on the East Coast. Four big projects with the potential to turn Kendall Square into more of a neighborhood. But the new building also could transform the street life of an area that can feel disconnected from the rest of Cambridge and has long been dogged by a certain lack of personality, at least in contrast to the charms of Harvard Square or the variety of downtown Boston. A decade ago, the city began plotting Kendall’s makeover, working with nearby residents and large property owners such as MIT and Boston Properties on plans for more housing, retail, and parks. New office buildings would include space aimed at startups — that often struggle to afford pricey Kendall rents — and incentives to attract long-desired grocery and drugstores and other neighborhood staples. And now, in the current real estate boom, those efforts are bearing fruit. Alexandria Real Estate Equities, for example, is paying for a 2-acre park alongside offices and apartments it is building on Binney Street. Boston Properties last year agreed to additional affordable housing and transit funding as part of a plan to build an additional 1 million square feet along Galileo Way. And MIT has been working with the city since 2008 on its plans along Main Street, where it will turn parking lots and small buildings into $1.2 billion of new development — most of which is aimed at private tenants and therefore on the city’s tax rolls. 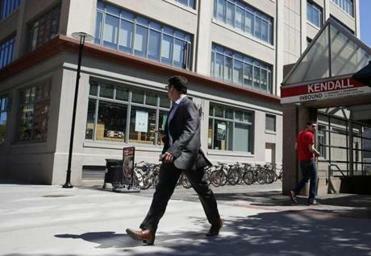 At its center will be a new “gateway” to campus, with the MIT Museum, the university’s welcome center, and admissions office arrayed around a new entrance to the Kendall Square MBTA station. Tree-lined walkways and plazas would wind around Main Street, new office buildings and a graduate student dorm to replace the aging Eastgate Tower. Across Broadway near the approach from the Longfellow Bridge, a new apartment building would go up on a parking lot that backs onto Broad Canal Way. MIT would build about 100,000 square feet of storefronts — half of which will be leased to “local, independent” businesses. Those places in particular should be valuable to the companies in the district, said Alexandra Lee, executive director of the Kendall Square Association, because they offer venues for workers to interact, which is part of the point of being in such a dense cluster of industry. And another big opportunity for Kendall is coming, in the pending redevelopment of the 14-acre Volpe Transportation Center, a federal research facility along Broadway. Many major real estate firms are already circling the site, and the US General Services Administration is expected in the next few weeks to officially request redevelopment bids. Cambridge officials have already suggested they would be open to allowing a building of up to 500 feet tall on the Volpe site in exchange for generous amounts of open space and affordable housing. Still, groundbreaking on the Volpe is likely at least a couple of years away. MIT, meanwhile, expects to soon begin the new dorm and sitework on the other projects. Rendering of a building on Main Street that is part of in the Kendall Square Initiative.